One of the activities we were most looking forward to in our time in San Ignacio was a visit to the Actun Tunichil Muknal cave (called ATM for short). This cave is undeveloped so it is quite an adventure just to explore. Plus, there are also Mayan artifacts and skeletons in a large chamber inside. We enjoy cave formations and we enjoy Mayan ruins, so this was an excellent activity for us! Because of the unique nature of the cave and its artifacts, you have to go there as part of a guided tour. The tours were quite expensive, but we decided it was a unique opportunity. We evaluated a few different tour guides and eventually chose Mayawalk because their offering was slightly cheaper. (We were warned their their tour would be rushed and impersonal, but that would turn out to be far from the truth). Our ATM tour was composed of us and 6 other people. We drove out to the trailhead with our guide Martin and started the mile-long walk to the cave. By the way, we don’t have any pictures from this adventure. A few years ago, a tourist dropped a camera on an ancient Maya skull, leaving a giant crack. So, the powers that be decided to ban cameras altogether. The walk out to the cave turned out to be pretty interesting just on its own. Martin would stop frequently to show us something interesting, such as leafcutter ants or cohune nuts (which we ate). There were also three river crossings which we had to ford. After some recent rains, the water was moving pretty swiftly! After a quick snack break, it was time to go into the cave itself. We put on our hard hats and headed for the cave. The entrance to the cave is pretty unique-you have to swim 20 feet across a deep pool of water! Some people indicated it was going to be difficult to get across, but it turned out to be easy. The first mile of the cave was definitely a pretty wild experience. This is not a calm path with a handrail – you are walking into an undeveloped area. The cave has water running through it which you are walking against most of the time ankle deep but in some cases chest deep! At one point Martin had us stop so he could look at our neck size, We were a little confused, but after going through the obstacle it made sense – you had to go through some chest deep water between two boulders.The best way is to go through with your neck between the skinniest part! After about a mile of spelunking,we got to the chamber with the Mayan artifacts. We took off our shoes because the artifacts are just lying on the ground right next to you, so they really didn’t want us stepping on them. First, we looked at many different examples of Mayan pottery. It seemed as if they were arranged into ceremonial offering sites. Martin had us as a group try and interpret what the layout might symbolize. We weren’t ever sure if we got it “right,” but that might have been the point. 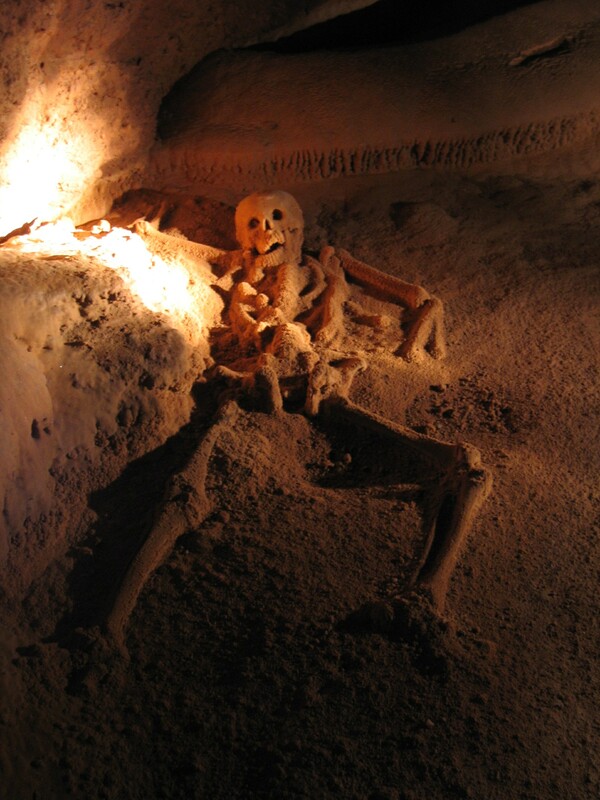 Then, we got to see actual skeletons of the Mayans that are still in the cave today. Over time, they have been calcified by the elements and almost look like part of the cave. It was pretty amazing to be able to observe them from a few feet away with nothing separating us. The most impressive remains are what they call the “Crystal Maiden,” a well-preserved female skeleton whose calcification causes the bones to sparkle. Because our group spent so long doing various interpretations, we were the last of the various tour groups that day out of the cave. At this point we were also starting to get pretty cold – our clothes were still wet from going through the water, and there isn’t any warm sunlight to dry us off underground! Therefore, we walked out of the cave and then down the trail much faster than we did one the way in. We had a late provided “lunch” back at the van, and then headed back to San Ignacio. Overall, we really enjoyed the trip and would highly recommend seeing ATM if you are in San Ignacio. It is worth the cost if you have any interest in caves or ancient artifacts. It certainly does not feel like something that you would be allowed to do in the US without filling out extensive paperwork!